It show a very young Crown Prince Olav whom would later become a beloved king of Norway. The picture of HMK Olav and F-864 is most likely taken during one of his visits to a motorcycle sport related event. 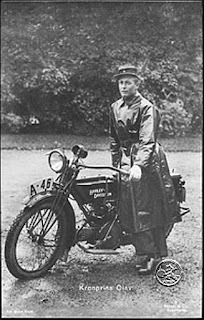 HMK Olav would become a keen motorcycle rider and owned his own Harley, this was a smaller Harley model O, or model Sport. On the picture below HMK Olav pose next to his bike. 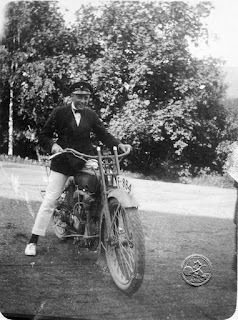 Back to HMK Olav and F-864, one can wonder if his white sailor pants where still white after sitting on the bike. My guess is, not so white. It is a fair chance HMK Olav`s simulated ride on F-864 sparked his desire for a Harley of his own.